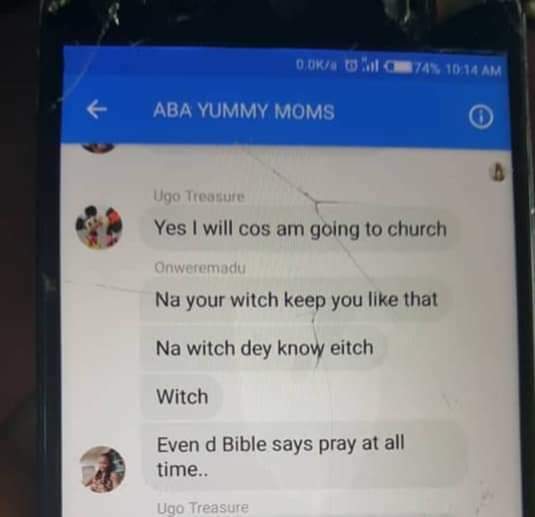 A woman by name, Ijeoma has shared screenshots of the conversation between two ladies on a Facebook group. 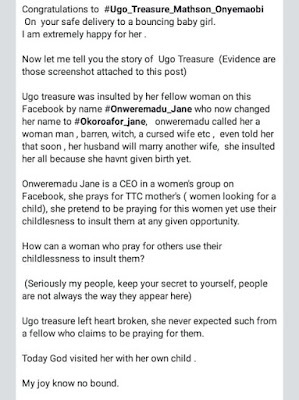 According to her, one Onweremadu Jane, the Leader of TTC women’s group on Facebook, a group that prays for women looking for a children, mocked a fellow member, Ugo Treasure who at the time was newly married and with no child. 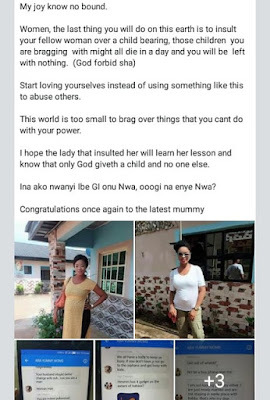 Though Ijeoma didn’t share what led to the argument, she took to Facebook to call out Jane for mocking her fellow woman because she didn’t have a child. 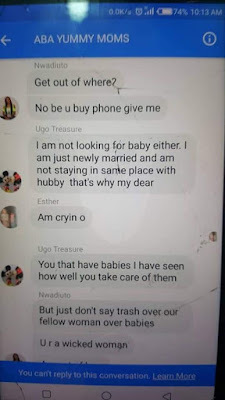 She also congratulated the new mother simply identified as Ugo Treasure. Congratulations to Ugo Treasure Mathson Onyemaobi, on your safe delivery to a bouncing baby girl. I am extremely happy for her . 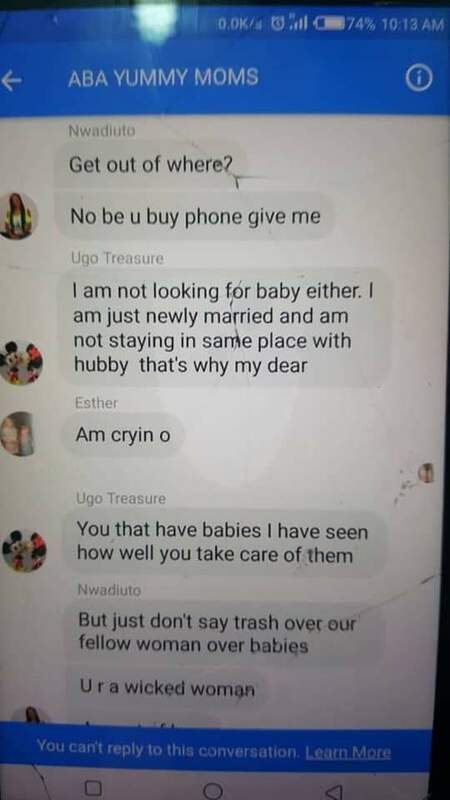 Ugo treasure was insulted by her fellow woman on this Facebook by name #Onweremadu_Jane who now changed her name to #Okoroafor_jane, onweremadu called her a woman man , barren, witch, a cursed wife etc , even told her that soon , her husband will marry another wife, she insulted her all because she havnt given birth yet. 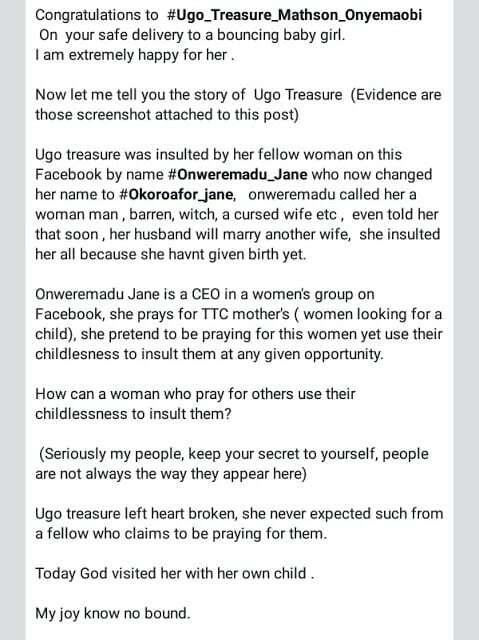 Onweremadu Jane is a CEO in a women’s group on Facebook, she prays for TTC mother’s ( women looking for a child), she pretend to be praying for this women yet use their childlesness to insult them at any given opportunity. How can a woman who pray for others use their childlessness to insult them? (Seriously my people, keep your secret to yourself, people are not always the way they appear here) Ugo treasure left heart broken, she never expected such from a fellow who claims to be praying for them. Today God visited her with her own child . My joy know no bound. Women, the last thing you will do on this earth is to insult your fellow woman over a child bearing, those children you are bragging with might all die in a day and you will be left with nothing. (God forbid sha) Start loving yourselves instead of using something like this to abuse others. This world is too small to brag over things that you cant do with your power. I hope the lady that insulted her will learn her lesson and know that only God giveth a child and no one else. 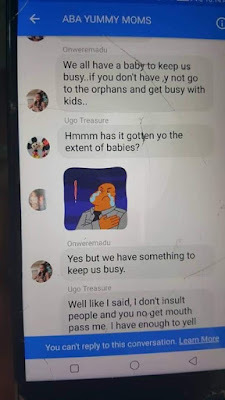 Ina ako nwanyi Ibe GI onu Nwa, ooogi na enye Nwa? 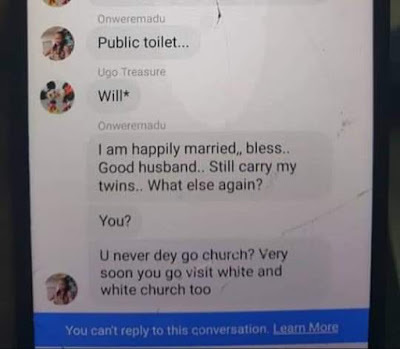 See screenshots of the conversation between both women and other group members on Facebook.